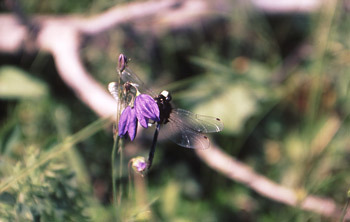 Ecosystem-based conservation planning is a method of ecosystem protection, maintenance, restoration, and human use that, as the first priority, maintains or restores natural ecological integrity—including biological diversity—across the full range of spatial (from very large to very small areas) and temporal (from short to long periods of time) scales. At the same time, it provides for ecologically and culturally sustainable communities and their economies. In other words, ecosystem-based conservation planning provides a picture of the ecological framework that is necessary to protect, and the ecological limits within which human uses need to be carried out, in order to be sustainable. The major goal of ecosystem-based conservation planning is first to protect, maintain, and, where necessary, restore fully functioning ecosystems at all spatial and temporal scales, and then to design human activities that fit within those constraints. Ecosystem-based conservation planning seeks to identify and understand the important ecological characteristics of a landscape or region, and then to design plans to guide the development of ecologically responsible human activities. This approach is based on the understanding that inappropriate human use of ecosystems and landscapes can have serious and long-term negative ecological, cultural, social, and economic impacts. Ecosystem-based conservation planning is also based on the understanding that ecological landscapes and patches are not static and unchanging⎯they contain a variety of ecosystem types and successional patterns through time that are tied to natural disturbance regimes. Natural changes diversify and maintain ecosystem composition, structure, and function at all scales; are unpredictable in frequency and character; and focus on sustaining the whole, not on producing any one part. In other words, change due to succession and natural disturbance is part of natural ecosystem functioning. Natural patterns of ecological succession and disturbance interact in unpredictable ways that sustain ecosystem functioning and provide a diverse range of habitat for plants, animals, and other organisms. Focus on what to protect, then on what to use. 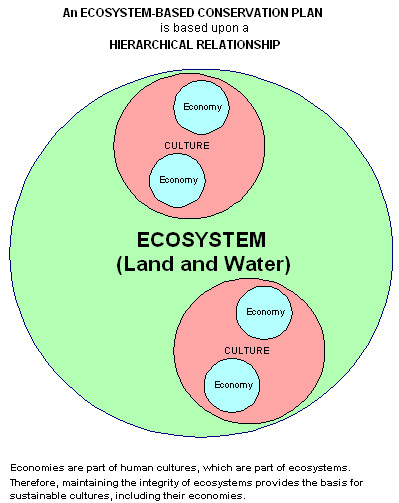 Recognize the hierarchical relationship between ecosystems, cultures, and economies. Apply the precautionary principle to all plans and activities. Protect, maintain, and, where necessary, restore ecological connectivity, and the full range of composition, structure, and function of enduring features, natural plant communities, and animal habitats and ranges. Facilitate the protection and/or restoration of Indigenous land use. Ensure that the planning process is inclusive of the range of values and interests. Provide for diverse, ecologically sustainable, community-based economies. For more information about the definition and principles of SFF’s ecosystem-based conservation planning, see our full article.